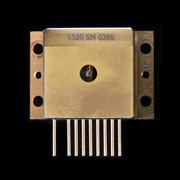 The Intense series 1300 of high power CW visible diode lasers are the state of the art in visible diode lasers today. These broad area multimode lasers offer extremely high brightness, excellent reliability, good quantum efficiency and low thermal impedance. Close tolerances to ±3nm are available in certain wavelengths. Available in a variety of open, window and fibered packages including C mount, 9MM, TO3 with TE cooler and HHL with TE cooler and fast axis collimator, these diode lasers are easily integrated into systems. Applications include Photodynamic Therapy, medical imaging and diagnostics, illumination, optical pumping and process control.